From small businesses to large office complexes to hotels and restaurants, all commercial properties must balance security with curb appeal in order to keep their employees and assets safe while maintaining an inviting appearance for customers. Wrought iron fences and gates offer an ideal way to meet these needs while delivering a strong return on investment. One of wrought iron’s main advantages for commercial properties is its natural durability, which makes it very difficult to breach. In addition, wrought iron fences and gates typically lack the handholds or footholds that their wood or aluminum counterparts have, making them hard for trespassers to climb. As a result, wrought iron fences and gates serve as an effective deterrent for wrongdoers and help commercial property owners ensure that their assets, employees, and customers feel safe. Wrought iron’s durability also translates to a strong return on investment, as it will stay in sound condition for years to come—even when exposed to rain, intense sun, and the high volume of traffic that is common at commercial properties. Another significant advantage of wrought iron is its timelessly elegant aesthetic. Even when wrought iron fences or gates are primarily designed to provide security for a property, they still enhance the property’s curb appeal and create an attractive look for customers. Additionally, wrought iron is highly malleable, allowing it to be shaped to suit any style. 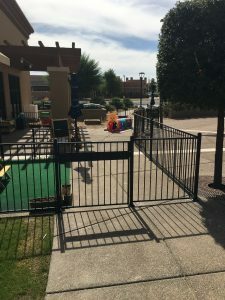 The managers of Scottsdale Villa Mirage, a condo-style resort in North Scottsdale, wanted to replace a large gate that had wide gaps between the pickets, which allowed too much visibility between the resort and the property next door. They consulted DCS Industries about creating a new gate that would improve privacy, curb appeal, and access control. Our team rose to the challenge with a 30-foot, solid gate that has an eye-catching ornate design and a rich brown hue to enhance the resort’s upscale style. We also installed privacy strips between the gate’s two halves, ensuring that the entrance is completely secured and the property is shielded from peeping passersby. To ensure safety for their young students, preschools and child care centers must comply with certain state regulations regarding fencing. 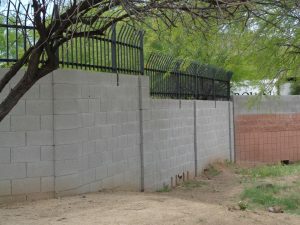 The team at DCS Industries is knowledgeable about these regulations, as well as other codes for fences and gates set forth by different cities in the Phoenix area. We worked with one local preschool to install a simple, black wrought iron fence and gate around the school’s outdoor play space. As required by law, these sturdy barriers are free of gaps wider than four inches, ensuring that children will not be able to escape through any openings and will remain safely within the designated area. The managers of the Phoenix office of DAUM Commercial Real Estate were concerned about vandals and other trespassers entering the office complex. They consulted DCS Industries about installing security fencing that would serve as a formidable barrier to wrongdoers without detracting from the property’s appearance. 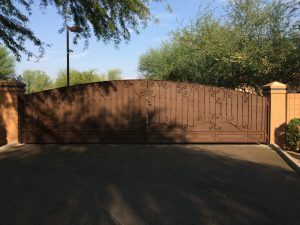 After assessing the situation, we enclosed the property’s perimeter with two sets of 30-foot, black wrought iron security fencing, including a large gate. The fencing features curved pickets at the top, giving it an intimidating appearance and creating a powerful deterrent for anyone who might attempt to climb the fence. At the same time, the wrought iron’s sleek style suits the property’s clean and contemporary aesthetic. In need of a new fence or gate for your commercial property? The team at DCS Industries will work with you to develop a custom wrought iron solution that suits your unique needs and style. Call us today at 623-825-7700 or contact us online to request a free estimate!